My father-in-law LOVES spicy things- actually that might be a bit of an understatement. I mean...he loves loves loves things packed with heat! Chili pepper heat that is....not gun heat. He loves chilies. Although...he might love things packed with guns too, what do I know. True story time! Since this guy can handle his spice so well and enjoys consuming things hotter than I could ever imagine even sniffing, it's my husband and my little secret goal to try and one day make him something SO HOT that he can't eat it. I mean, we really love trying to "get him good" with the spiciest things we can make- which isn't easy! Hasn't happened yet. We'll head to our local Whole Foods, browse the chili pepper aisle...grab handfuls upon handfuls of the spiciest chilies we can find, and then head home and make stuff so heavy with chili peppers that our eyes will literally be watering while in the house cooking with them! Not even joking. Quite a few times we've had to open up all doors and windows to try and air out our little home from the spicy air! We're choking and crying while our cats are running into the bedroom to hide under the bed. It's quite the sight! Then we'll gift whatever it is we've made, give it to him (while trying to hold back our excitement and almost uncontrollable anticipation), watch him eat it (while on the edge of our seats, giggling and all giddy)....and watch him smile and say, "...MmmMmm....That's pretty tasty" and go about his merry way. LIKE NOTHING HAPPENED! LIKE WE DIDN'T JUST MAKE AN ATOM BOMB EQUIVALENCY'S WORTH OF HEAT IN A JAR. I'm starting to think he's burned all his taste buds off, long ago. Our latest test- a batch of my pickled vegetables that he likes, only this time- kicked up 1,000,000,000 notches in the Scoville heat scale. Bwahahaha. We were SURE we got him this Father's Day. His little batch of 3 quart sized jars included 10 serranos AND 10 habaneros. My oh my. Outcome- he loved them! Ate and ate and ate straight from the jar right after opening up his gifts. Buuuuuut, were they too spicy for him? Nope. "Yeah, they've got a little heat..." he said. Pfffft. So I grabbed a carrot stick and tried for myself....and instantly regretted it. The whole right side of my mouth became instantly numb. Humpf. The regular pickled veggies are pretty yummy, if I may say so myself. Can I? My husband and I love having batches of these (or just plain pickles, sans other veggies) in our fridge at all times. Good thing about them- you make a batch one afternoon, and they'll keep for almost ever. Weeks upon weeks opened and months upon months unopened. 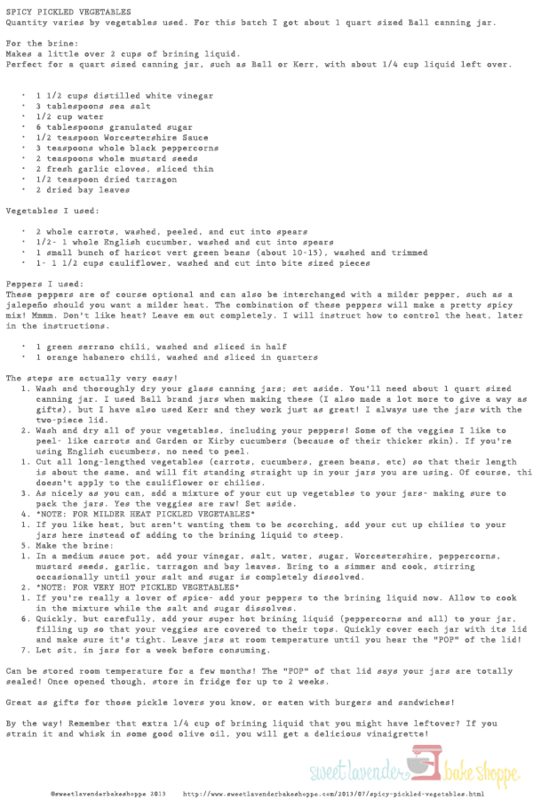 So, I thought you guys might want the recipe since canning and pickling are like, major things right now! As Portlandia would say, "We can pickle that!" Quantity varies by vegetables used. For this batch I got about 1 quart sized Ball canning jar. Makes a little over 2 cups of brining liquid. Perfect for a quart sized canning jar, such as Ball or Kerr, with about 1/4 cup liquid left over. These peppers are of course optional and can also be interchanged with a milder pepper, such as a jalepeño should you want a milder heat. The combination of these peppers will make a pretty spicy mix! Mmmm. Don't like heat? Leave em out completely. I will instruct how to control the heat, later in the instructions. The steps are actually very easy! Wash and thoroughly dry your glass canning jars; set aside. You'll need about 1 quart sized canning jar. I used Ball brand jars when making these (I also made a lot more to give a way as gifts), but I have also used Kerr and they work just as great! I always use the jars with the two-piece lid. Wash and dry all of your vegetables, including your peppers! Some of the veggies I like to peel- like carrots and Garden or Kirby cucumbers (because of their thicker skin). If you're using English cucumbers, no need to peel. Cut all long-lengthed vegetables (carrots, cucumbers, green beans, etc) so that their length is about the same, and will fit standing straight up in your jars you are using. Of course, this doesn't apply to the cauliflower or chilies. As nicely as you can, add a mixture of your cut up vegetables to your jars- making sure to pack the jars. Yes the veggies are raw! Set aside. If you like heat, but aren't wanting them to be scorching, add your cut up chilies to your jars here instead of adding to the brining liquid to steep. In a medium sauce pot, add your vinegar, salt, water, sugar, Worcestershire, peppercorns, mustard seeds, garlic, tarragon and bay leaves. Bring to a simmer and cook, stirring occasionally until your salt and sugar is completely dissolved. If you're really a lover of spice- add your peppers to the brining liquid now. Allow to cook in the mixture while the salt and sugar dissolves. Quickly, but carefully, add your super hot brining liquid (peppercorns and all) to your jar, filling up so that your veggies are covered to their tops. Quickly cover each jar with its lid and make sure it's tight. Leave jars at room temperature until you hear the "POP" of the lid! Let sit, in jars for a week before consuming. The "POP" of that lid says your jars are totally sealed! Once opened though, store in fridge for up to 2 weeks. Great as gifts for those pickle lovers you know, or eaten with burgers and sandwiches! By the way! Remember that extra 1/4 cup of brining liquid that you might have leftover? If you strain it and whisk in some good olive oil, you will get a delicious vinaigrette! Oh and I need to mention- once your veggies are all eaten up, don't throw that liquid away! 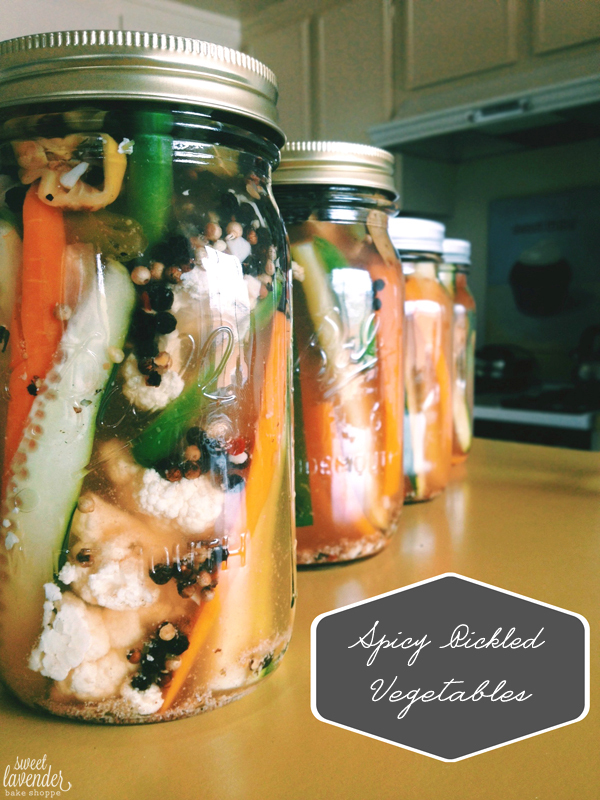 Just simply add more veggies to the brine, close up, and allow to sit in fridge a few days to easily create MORE pickles! YAY! i need to try this! my favorite restaurant has spicy veggies with their meat and cheese board, I want to replicate it! I love spicy anything!!! You can't beat heat!! :) And I'm such a sucker for any kind of spicy pickled veggies. At the farmer's market I get a jar of the spicy pickled asparagus spears. They are gone before we even get home! oh my gosh. I'm such a wimp when it comes to heat.. (guns and spices alike) ... but my fiance LOVES spicy things. Maybe I could make him a special treat, sometime. He would love me for this recipe. Hahahaha, eeeep you made me giggle. I am DEFINITELY a wimp when it comes to gun heat. BUt spice in a food? Kind of like it. Hope you do try and love it! You can totally use as much or little chili peppers as you're comfy with. Maybe just a 1/2 or 1/4 of a jalapeño would be good for you.